The plantar fascia is a piece of connective tissue consisting of three bands. These bands attach at the heel bone (calcaneus) and span under the foot to anchor at the toes, specifically the metatarsal heads.1 There is also an anatomical connection between the plantar fascia and the Achilles tendon, thereby linking these two structures. 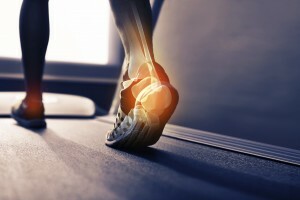 If you have any questions regarding plantar fasciitis or other foot injuries, please stop by or call your local ApexNetwork Physical Therapy clinic, or visit www.apexnetworkpt.com. 1McPoil, Thomas G. et al. “Heel Pain – Plantar Fasciitis: Clinical Practice Guidelines Linked to the International Classification of Function, Disability, and Health from the Orthopaedic Section of the American Physical Therapy Association.” J Orthop Sports Phys Ther. 2008: 38 (4): A1-A18. ApexNetwork Opening Soon in Bernalillo, NM!